This entry was posted in 12 x 12 Picture Book Challenge, 2012 Positive Parental Participation Challenge, children's picture books, Crafting with Children, parenting, Poetry Contest, Reading with Children and tagged Book review, dr seuss birthday, Dr. Seuss, Ella Johnson, Kevin Henkes, Picture book, Pre-kindergarten, Spaghetti Eddie by viviankirkfield. Bookmark the permalink. Love the craft of expressing feelings through puppets and their families. perfect for this perfect picture book friday idea. I also think read alloud day should be celebrated with kids and the people who read to them. Do you link up in the am to her story link up ? Great selection. I’m not familiar with this Kevin Henkes book. He is such a wonderful writer. Great activities as usual. The puppets are a great way to talk about feelings. Loved your review and choice. Glad you liked the choice! Congrats on your poem and the reading to kids sounds great too. Kevin Henkes is super, this sounds great. And what a cute craft too. Thank you, Catherine. I love reading picture books to young children…maybe as much or more than they like hearing them. 🙂 Making puppets is quick, easy and so much fun…perfect for storytelling and roleplaying. Thanks for the congrats, Susanna…no one was more surprised than me. 🙂 The first two lines just wrote themselves…and I realized they had been inside me all of my life. Glad you love Julius and Lilly as much as I do…Lilly openly expresses what so many children are feeling…in the introduction of my book, I relay my oldest son’s reactions (he was 3 at the time) when I returned home from the hospital with his new baby brother. He took one look at us, turned his back on me, and ran into the house screaming, “If you loved me, why do you need him?” Why indeed! Unfortunately, this book hadn’t been written yet, but I did read him Peter’s Chair by Ezra Jack Keats. So much fun stuff in this post! Love the book choices, activities, and the fact that you finished your 12 x 12 draft! Thanks, Julie! At the risk of repeating myself and boring you…again I thank you so very much for issuing the 12 x 12 challenge and organizing it in such an amazing way…the guest posters you have add immense value to the entire exercise. Will this wonderful energized walking-on-air feeling go away at the end of the 12 x 12 Challenge? I don’t think so…now that I’ve begun writing again, I know I will never stop…it’s too much fun! Great choice, Vivian. I did a Kevin Henkes book this week, too! This book is a perfect conversation starter. 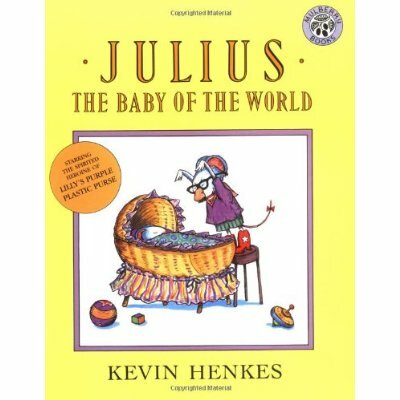 My kids gasp in horror when Lilly says, “And I hate Julius,” because “hate” is not a word that is allowed in our house. But it represents such real feelings and I love that we can talk about how Lilly feels and how we should deal with those feelings. Learning to be kind even when we don’t feel like it is such a hard skill to master. What a fun craft to go with the charming book. Lots of Dr. Seuss events all over the place! Glad you liked the book and craft…I’ll be sharing them with several kindergarten classes next month. Congrats on your poem, Vivian. I too love your puppet craft activity. This is such a good, unthreatening way for children maybe struggling with similar sibling jealousy to express their feelings. This is a Kevin Henkes book I hadn’t heard of, so many thanks for the choice. Glad you liked the PPBF pick! Yes, I love puppets for kids…so many ways we can use them…just storytelling is great for their literacy skills…and then role-playing for expressing emotions and addressing concerns. Ooo, I had forgotten about this fabulous book! I have to recommend it to a friend who recently had a baby boy and has a daughter turning 4. Perfect for them! Glad this book will hit the spot with your friends. I love picture books that have these great messages! I love those little Popsicle people. I might have to help my grandchildren make a few of those myself. 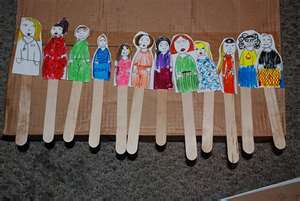 And the Popsicle stick people can also be Popsicle stick animals or storybook characters…very versatile activity…I’ll be making some with my grandson in April when I stay with him in April. My grandkids love that sort of thing… you know, scissors, glue, construction paper, so thanks for the share. 😉 Enjoy your visit with you little grandcritter… they grow up so fast. Thanks for this. I have lots of friends with new babies who will probably encounter sibling rivalry. It’s always nice to have books to encourage the conversation. Being a big brother, I can say that I am not always happy with my little sister….but I think she gets annoyed my me too. I like your puppet activity! Thank you, Erik. So glad you liked the book and puppet activity. And thank you so much for sharing about you and your sister. When I was pregnant with my second child, I was worried about sibling rivalry and everyone around me told me my son would be jealous of his brother for the rest of his life. Thank you for addressing the issue of sibling rivalry and providing the link to the book that helped you. We all need all the resources we can get. Also, your point about the children fighting over toys is a good one. Maybe we can talk about it in a post and provide some books that would help…I will do some research, ok? Sounds good. I know there are many children’s books on sibling rivalry but a lot of them just deal with the arrival of a new baby, not the everyday life of sharing everything with siblings (and not just parents!). BTW, is this the page for the March books? My son read this book in school and asked me to get it at the library. It’s called I Need My Monster and it’s hilarious. I borrowed a lot of books about Monsters so I’ll have to share the best ones here and on my blog. Santa Claws is a good one too (monsters do get presents when they’re good and scary). Oh, and I’d like to mention the book Extra Yarn. Great story about a girl finding a box with neverending yarn and knitting sweaters for everyone until a pirate steals the box from her after she refuses to sell it. Milka…you are amazing…I love your enthusiasm for books and reading to your kids…you are a very special lady! Love the books you are reading, by the way. Haven’t read a book by Kevin Henkes in a while, and I haven’t heard of this one before. My kids are definitely going through sibling rivalry right now. Great choice. Thanks! I love this book because Lilly is so over-the-top with her jealously…and even kids who don’t get along will observe that…and hopefully will pick up on the turn-around that Lilly does at the end of the book. Congratulations on the win. Great choice and fun activities for even those without sibling rivalries. Thank you, Stacy…I was really happy about it! You are so right about the book being a great choice, even for kids that don’t have brothers and sisters…it’s also about getting along with others and accepting each person as they are. you’ve mentioned a classic issue between siblings – rivalry! From a family of 6 children, I know very well about siblings rivalry but good thing that it was well controled and just passing. Now, talking about siblings, made me miss them even more! It’s really hard to leave oceans away from the family. Love Kevin Henkes…so I have to read this book! 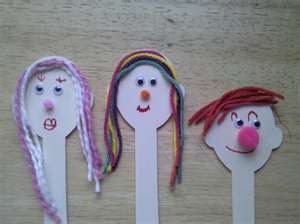 The popsicle puppets are just a great idea! It is a really fun book…hilarious what Lilly says about her brother! Glad you liked the craft project. The kids love making puppets. I simply must read this book! Kevin Henkes is bodacious! Thanks for visiting my blog mummumstheword.wordpress.com and putting a link to my latest post “Seeing a new picture in picture books” in your Perfect Picture Book Friday post above. I was delighted to visit your site and find it’s exactly what I was looking for so I’ve signed up to follow your blog! And your book is great – being a picture book author, I am naturally thinking of finding some resources where I can use picture books for teaching and doing fun stuff with Caleb. How do I get your book here in Singapore? I’m thrilled you came to visit my blog!!! I’ve loved picture books my entire life. When I saw your post, I knew I had to share it with my readers. If you would like to buy a copy of my book 🙂 I can definitely get one to you. Let me find out the cost of mailing a book to Singapore. I’ll email you the info. That’s such a sweet story. I love Kevin Henkes’ books. And thank you for visiting my blog. Have a great day! I LOVE your website! Have an awesome week! thankyou for sharing such a great book. Kevin is a great author. Loved your craft ideas to get kids involved in discussion about a new arrival, or competing for attention…. ( happens in most families). Lastly congrats on your 2nd place listing…. well done you! Books like this one give parents and kids an opportunity to engage and talk about the problem and their feelings. We’ve read lots of great fun books this past week, but here’s my weekly update. I went to your WWW post, Milka…great books!!! As promised, here are some monster books we’ve been enjoying recently, besides the ones I hightlighted in my weekly update. My youngest also got this book at the pediatrician’s office for his annual check-up, Boom Chicka Rock. It’s a fun book about counting and reading time. Thanks for the list, Milka…great choices…love the funny monster books…I will have to pick up a few to bring to NH when I visit my grandson. Congratulations Vivian!!! You deserve it!! Here are the books we’ve been reading this week and a link to my blog about them. And with my oldest daughter, we just finished reading a Disney Princess chapter book – “Tiana: The Grand Opening”. She’s so excited that she was able to read 2 chapter “in her head”! Here are a few more books we’ve been reading this week. I love Toot & Puddle! National Geographic for kids also has a book series to teach kids about various subjects. We’ve read volcanoes, migrations and just tonight Cats vs. dogs. Very well done. We just read “Little Bunny Foo Foo, the REAL story” and it’s absolutely hilarious, especially when kids know the original story. Another great twist on well known fairy tales is called The Princess and the Pig. We loved it! Especially the recurring line, “because that’s what happen in fairy tales.” It really makes kids think about fighting paradigms. A great concept and a very funny story. Milka…I’m so very happy that you are taking part in the reading challenge…the books you read with your children are usually ones I have not heard of before…it’s a great resource for me! Hope your weekend went well…how is your husband doing? He’s done with rehab and going back to work tomorrow. I try to order many books at the library but author, illustrator, category or theme. We get a whole bunch, read and re-read those we like, return those we don’t. I usually have at least 100 books checked out at any time so we have the luxury to choose almost any book every night. Feel free to read the books we’ve enjoyed. I hope we’re not the only ones to appreciate them! Oh Milka…I am so very happy!